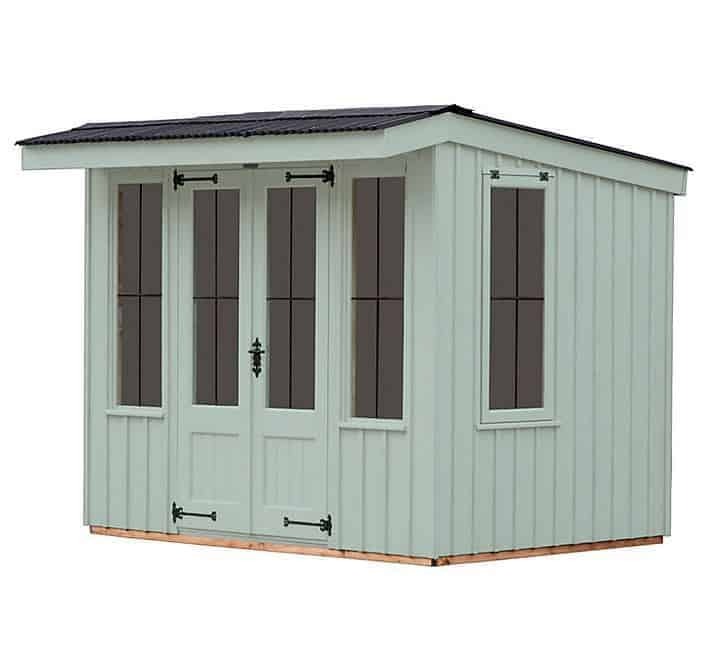 We think that it is scientifically impossible not to be wowed by this fantastic, compact sized, Flatford Summerhouse. 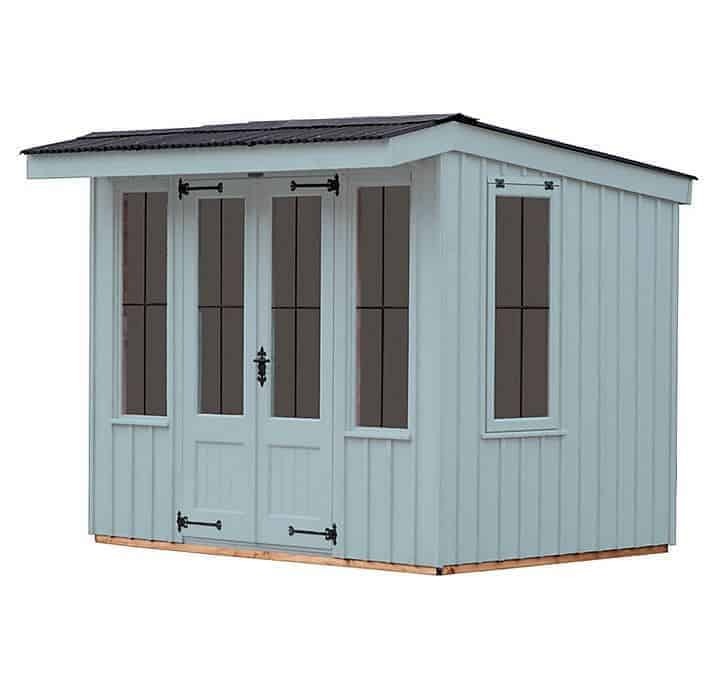 The National Trust series of sheds from Crane have been impressing us for a while now. 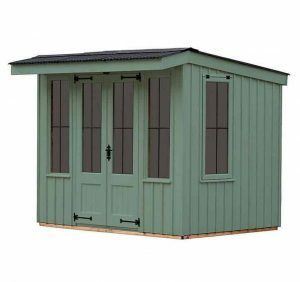 They idea is that they are to resemble the old, English style of sheds that were very popular around East Anglia. 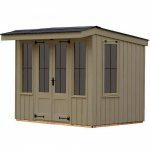 Well as well as sheds they also have this just amazing line of summerhouses that as soon as you see it, you will be picturing yourself sitting in there with the doors open on a nice day and with a drink in your hand. Using a corrugated apex style roof really does set this summer house apart from all the rest that are using roofing felt. But we think the first thing that most people’s eyes will be drawn to is those huge windows that just ooze charm and personality and make this a hard summerhouse to resist! We know that with how good looking this summerhouse it, you may be tempted to start just throwing money at the screen, but before you do that keep on reading and see if this Flatford Summerhouse lives up to its epic first impression. What we have here is the smallest version of this summerhouse which means it is for you folks who do not have a huge amount of space in your garden, but who want a nice little spot to kick back and relax in….. probably with a glass of wine in your hand. 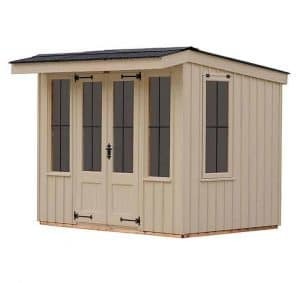 5 feet 9 inches is the width of the summerhouse and 7 feet 8 inches in length so there is a decent amount of depth to the summerhouse and we do think it feels bigger than the dimension suggest once you are inside it. At the highest point which is at the front, you have around 7 feet of space so unless you are some kind of giant, basketball player, you will not have to duck when you go inside. At the lowest point of the summerhouse the height is 5 feet 9 inches which is the standard for this line. With some clever planning, you will be able to get a couple of chairs, a table and a few nick knacks as well. 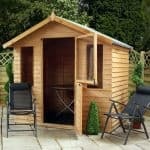 This is the type of summerhouse where it is up to you to maximise the space that you have. 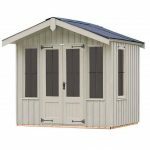 We know that when some people see the 6 x 8 they may be quick to dismiss the summerhouse, but with some clever planning you can pretty much fit what you want in here. The apex style corrugated roof is just so well made, but we think that because of how nice those windows look it may get overlooked. Crane to give the roof a little bit more personality and not to make it look like a shed have made the roof slightly different heights at the front and back and we love it! The roof on the inside first of all has some strong 19 x 125 tongue and groove roof boards to keep that corrugated roofing up. What really took us by surprise though was that there is an actual ceiling covering this! Crane have put this lovely pine and tongue groove ceiling in there and it just makes it look incredible. Let’s face it if you have paid all this money for a summerhouse last thing you want to see when you look up is roof boards! All the sheds and other summerhouses in the National Trust line from Crane use the same, sawn board cladding. 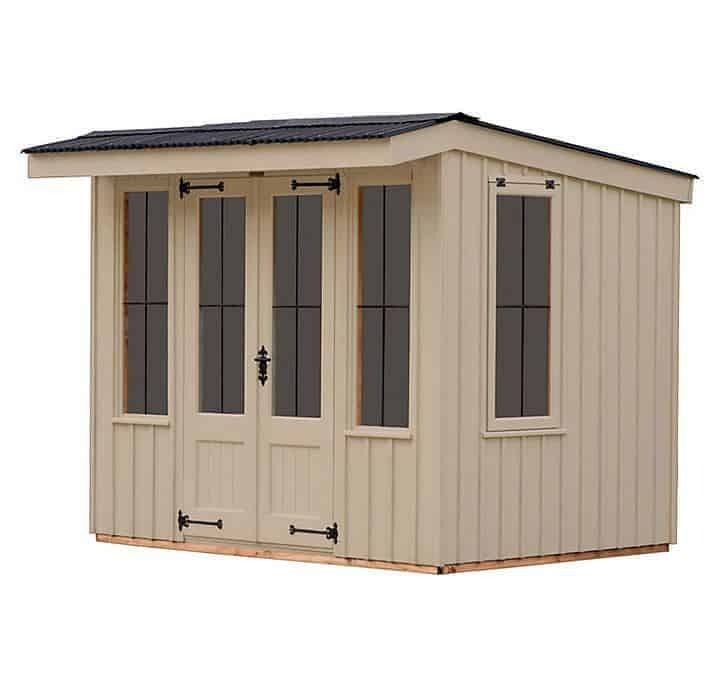 It is a very smart design choice as it really does give it an old school look and it certainly makes it stand out from the way sheds are designed the majority of the time these days. The wood that is used for the cladding is Scandinavian Redwood and just saying that out loud makes you think of huge, thick and giant trees! This wood is some of the strongest wood you can get and at 12 x 150 which is then topped by some 16 x 38 mm cladding, you have a strong set of walls. We are very impressed with the cladding that is used here it does exactly what you want it to do. It keeps the water out and it looks just amazing doing it! 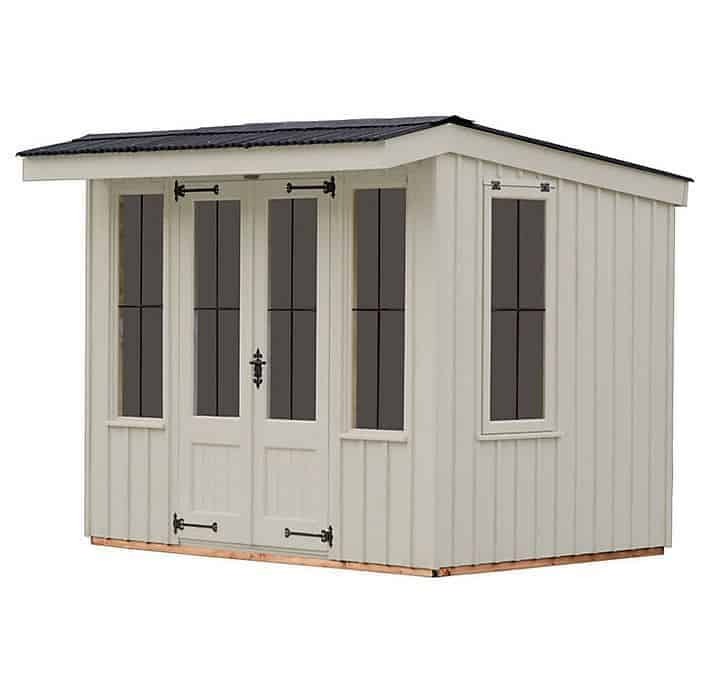 When you buy a summerhouse like this, you are buying it with the intent of spending some serious time in there. So with that being said, you want, pray and hope that the framing is going to be nice and strong. Well the frame is thick, coming in at 38 x 50 mm and it is made from that same Scandinavian Redwood we just talked about before! No one wants their summerhouse (especially one that cost over 4 grand!) to start getting all flimsy because of a week frame. This is not an issue the Flatford Summerhouse will have as this frame is built to last and built with very strong wood. It goes without saying that you will want to put some nice things in your summerhouse. A couple of chairs, some shelves? Perhaps a table? You will surely have a ton of ideas about how you are going to lay this out. Thankfully the flooring that Crane have put in here is very strong and does not have that awful, bouncy and cheap feeling that we hate. The same boards that are used for the roof that 19 x 125 mm tongue and groove boarding which is good and strong in its own right, but they are also sitting on 38 x 50 mm floor joists. We have no worries about the flooring of this summerhouse at all……. Unless you plan on throwing barn dances or hootenanny’s in here of course! 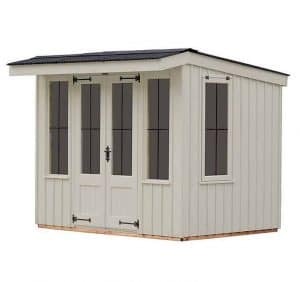 Crane are giving you their 2 year warranty that will cover your summerhouse against what they call general wear and tear. They come to your home and make the repairs that are needed or if need be they can replace a broken part. 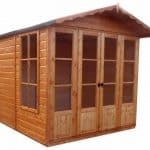 The warranty will not cover against accidental damage or if you insist that they place the summerhouse in a section of your garden that they have told you is not suitable. The doors are absolutely fantastic! At 1100 high and at 1830 mm wide you have more than enough room to get whatever it is you want inside. There will be none of that awkward, rotating stuff around to get it to fit like you get with a single door shed! There is a nice large window in each door that is made from some very strong, 4 mm thick glass which has been toughened. There is also a very nice lead cross in the window which adds character to the summerhouse. The doors are held onto the summerhouse with some, Fleur – de- Leys hinges which are a nice deep black colour and go very well with the door handle which is the same colour. Crane have gone a little bit crazy with the windows on this summerhouse, but we love it! There are six windows if you include the two on the door. The other four windows are slightly taller than the ones on the door, but they are made from the same glass and have that lead cross detail on them. The two windows that are on the sides of the summerhouse actually open up and do so with strong black hinges that fit in with the ones on the door. The Flatford Summerhouse does come with a lock and key. They use a nice and secure, mortise style lock. Crane have such a great attention to detail that the lock is actually the same colour as the hinges and door handle. With six windows this is a structure that is very open and inviting, but for some that may signal a lack of privacy. We think a nice set of blinds would work wonderfully well if you are not keen on having your belongings inside always on display thanks to the windows. With six different colours of paint for you to pick from, you are almost spoilt for choice. Earls Grey, Painters Grey, Disraeli Green, Terrace Green, Wades Lantern and Dome Ochre are available. We like how there are some reserved colours and a few “playful” colours as well. While the price may be high so is the quality. Crane have done just an incredible job in bringing this summerhouse to life. 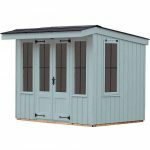 Using thick, toughened glass and Scandinavian Redwood, The Flatford Summerhouse has been made with the finest materials and designed to last for many, many years. With some good TLC, you will be able to enjoy this for years to come. Like we said this is the smallest version of this summerhouse and we know for some people 6 x 8 is going to be a real struggle. But for you folks who love to work out ways to make the most out of the space you have. 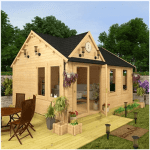 We are sure that you can really fit a lot of items in this summerhouse and have fun doing it. Still it will take some work to make it happen! Anything that has this much glass has the tendency to go very wrong when you are building it…… thankfully, you will not be the one building it as Crane do the installation for you. So put down the hammer and go grab and drink and relax. 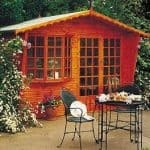 Look we really do love this summerhouse, but £4,399.00 is a heck of a lot of money to pay for a structure that is 6 x 8. Especially with what else is on the market in this size, but there is no denying just how amazing this looks, but these looks come at a big price! Final Thoughts: The Flatford Summerhouse is one of the most well designed, good looking and fun summerhouses we have had the pleasure to check out in a long time. It is made from amazing materials, looks gorgeous and would make your garden the envy of the whole street, but it is on the expensive side for how big it is...…… but if you really want to make your garden look amazing and have a nice, special place to relax and money is not an issue we say this is well worth thinking about.